Kurt Ramborger grew up in his Deaf mother's and Irish grandmother's kitchens. He enjoyed cooking, and wanted to be a chef . . . but he didn't know of any other professional Deaf chefs. That didn't deter him. A native Californian (CSD, CSUN, and Pierce Community College), Kurt now lives in Austin; his children, Malvana Allawyn and Jahren Islwyn (whom he calls "the Wyns" for short), attend Texas School for the Deaf. He co-parents with Cat Cassidy, "Momcat." When Eater.com launched its 2012 "Hottest Chef in America" competition, Kurt's Deaf sisters Heidi Branch and Marlena Ramborger organized an intensive online-publicity campaign, enlisting the Deaf community to vote and spread the word, and Kurt won the just-for-fun competition, first locally, then regionally, then nationally. Paul Rutowski's striking black-and-white photo of a shirtless Kurt brandishing three of his favorite knives and a sharpening steel, peeking mischievously at the viewer through the blades, became an iconic image in the Deaf community, with fans posting their own parodies of it in playful tribute. His attitude towards cooking, however, has been serious, but spiced with playfulness. His Sinful Brownies were so delectable that they gained him several marriage proposals, which he cheerfully fended off. When DEAF LIFE chose Chef Kurt as "Deaf Person of the Month" (March 2012), he and Rutowski were partnering at Viuda Bistro at René Alcala's Casa Alde in Buda; that venture lasted almost a year. As a result of the "Hottest Chef" publicity, he received an invitation to compete on the Food Network's most popular show, Chopped, which brings together four professional chefs from various backgrounds and challenges them to create outstanding dishes in a short time and using several unconventional, even wacky, combinations of ingredients. Each dish is judged on creativity, presentation, and taste. There's a panel of three judges, all of whom are professional chefs and/or restaurateurs, with Ted Allen, gourmet and cookbook author, as host. One chef is chopped" (cut from competition) after each round. The chef who survives all three rounds—appetizer, entrée, and dessert—wins a $10,000 prize. Kurt's episode, "Better Saffron than Sorry," first aired on June 4, 2013. His competitors were Chef Martha Esquive, Chef David Fuñe, and Chef Christian Dolias. 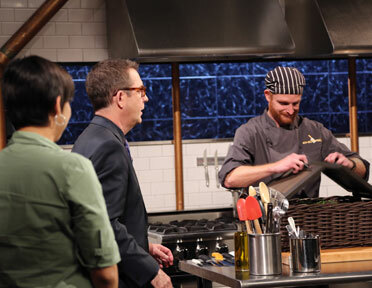 Each Chopped competitor is spotlighted in a background segment, showing them at work and with friends or family. Chef Kurt was shown cooking, and at home chatting in ASL with Malvana and Jahren, then making Sinful Brownies with Jahren (who wants to become a chef). "You don't need ears to cook!" he insisted. He was accompanied by Lydia Callis, one of the finest interpreters in the nation, and praises her fine work—nothing had to be repeated. Michele Westfall, who runs the Piss on Bell Facebook group, noted that this episode was a great example of how Deaf competitors should be treated on TV—he was treated exactly as any other competitor. His appearance has had tremendous impact on viewers, including hearing ones who decided that they really wanted to learn ASL, and young Deaf people, who realized that they too wanted to pursue culinary careers. There has been an upsurge in Deaf enrollment in culinary schools and programs. Chef Kurt has also mentored Deaf chefs, conducted cooking classes, and encouraged others to pursue their ambitions. For now, he's retired from catering to focus on parenting, as the Wyns are already teenagers, and working as Lead Chef at The Blind Squirrel Sandwiches in Round Rock, an upscale lunchroom specializing in sandwiches with an artisanal twist. He loves his Blind Squirrel crewmates: owner Jack Raia, Gary Hryb, and Keith Pascar. If you're in the Austin area, stop by, feast, and give them a high five.